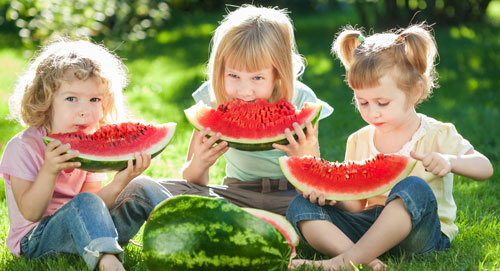 Five Watermelon Themed Fun For Kids - What About Watermelon? We all know that watermelon can be used in a variety of sweet and savory recipes but in this article we will explore some fun watermelon themed craft, activities and visually appealing food for kids! Every child loves Halloween. If its the door to door knocking, the receiving and devouring of treats, the tricks, the dressing up or the carving. For most of us when we think of Halloween and carving we automatically think of the bright orange pumpkins on sale at the local supermarkets but carving a watermelon is just as fun and during October generally half the price! 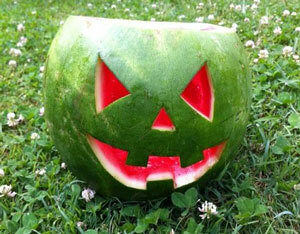 What you will need: a pen (draw on the design of your spooky watermelons face), a sharp knife (for adult use only to carve out your spooky watermelon) and a small ice cream scoop (for scooping away the watermelon flesh to reveal your your watermelon carving). Such a simple craft for the kids during the holidays. All your will need is a spare glass jar (emptied and cleaned), rice, green and red food coloring, and a sprinkle of black beans. Simply die one cup of rice red, and another cup of rice green. Set aside over night to allow the food colouring to dry. Add one inch of green rice to the jar, add two inches of red rice mixing in a few black beans as you go and top with green rice. Tighten the lid. 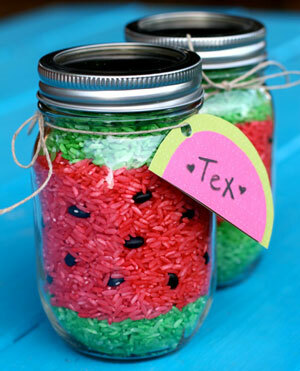 You should have created a rice jar similar to the one pictured below. Are your kids afraid eating fruit or vegetables will kill them? Using a cookie cutter, using flat pieces of watermelon cut out fun shapes. The kids are sure to be begging for more! 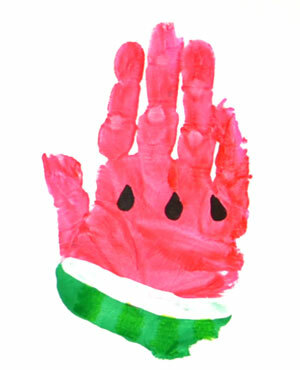 We all love paint hand prints of our children to keep forever although a nice twist on the normal paint hand prints is watermelon hand print art. All you need is three paint colors (non toxic paint), one piece of paper or cardboard, a black marker and a paint brush. Using green paint, paint the base of your child’s hand, immediately paint a strip above the green paint with white paint and the rest of the palm and fingers using the red paint. Press child’s hand down onto paper or cardboard. Set aside to dry and ensure child washes hands thoroughly. Once your artwork has dried you can add circles of marker on the red paint to represent the watermelon seeds. You will have created something similar to our example image below. 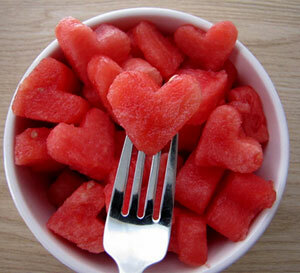 Most children love milkshakes so why not add watermelon as the flavor! Its a lot healthier than sugar syrups that are generally added to kids milkshakes and watermelon has added vitamins and minerals. 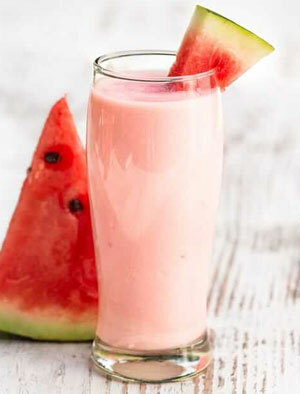 Using a blender, simply add 2 teaspoons of sugar, 1 1/2 cups of cubed watermelon and two cups of full cream milk. Pulse until all ingredients are blended through. Pour into milkshake glasses and enjoy.